Yes, fan, it’s a Health/Medical edition of SASB! “…more akin to religion than to science.” How fitting when stem cells are the topic! Of course these are one’s own, cancerous stem cells in question. Cancer patients and their families are desperate, so promising drugs can get expedited approval, even if, as noted, they don’t prolong life. It would be spectacular if this stem cell related research might yield an effective, more permanent treatment. I hope the Sarkisyan family wins their lawsuit and is award millions and millions of dollars. It is time for these $7.00/hour clerks at the insurance companies to stop playing doctor. LOS ANGELES (AP) – The family of a 17-year-old girl who died hours after her health insurer reversed a decision and said it would pay for a liver transplant plans to sue the company, their attorney said Friday. Len updated the post with a link to a more complete analysis — definitely worth the detour. Tragedy is tragedy, but the absolute worst ones are those that were preventable: Katrina, the I-35 bridge, and now Nataline Sarkisyan are all examples of bureaucratic failures caused by a deliberate policy of undercutting the public good in the service of private political agendas, in the first two examples, and shareholder profit, in poor Nataline’s case. U.S. healthcare needs fixing, and here’s a story pointing to an unexpected cause, and potential fix. This week, NYTimes published its list of top economics books as chosen by its columnist, David Leonhardt. His No. 1 book is one I’d not encountered — shame on me! 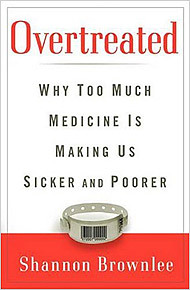 “Overtreated” by Shannon Brownlee, above, diagnoses the big flaw in medical spending. As you’ve doubtless heard, this country spends far more money per person on medical care than other countries and still seems to get worse results. We devote 16 percent of our gross domestic product to health care, while Canada and France, where people live longer, spend about 10 percent. So, we’re overtreated, but undercured. Part due to our fee-for-service system; part due to our own ignorance of medicine’s true costs when we ourselves are the patients; part due to that “byzantine health insurance system” that dazzles and confuses us, and lets Natalines die rather than pay. As Leonhardt makes clear, the true value of this book is that it has clear and achievable recommendations for reforming our sick healthcare system. When it’s back in stock (ah, the power of the press!) we ought to buy copies for every senator, congressperson and presidential candidate. So, that’s our Health/Medicine edition of SASB ©. Stay healthy! Note! : the links to Amazon.com used above is for the convenience of faithful reader and represents no commercial relationship whatsoever. Left-Handed Complement should be so fortunate as to ever collect remuneration of any kind for this endeavor. I can link, so I link. It’s technology. It’s cool. It’s an artifact of Sequitur Service©. Deal with it. This entry was posted on Saturday, December 22nd, 2007 at 3:47 pm and is filed under Economy, Health, musings, Politics, Science. You can follow any responses to this entry through the RSS 2.0 feed. You can leave a response, or trackback from your own site. 4 Responses to mm230: Stem Cells; Insurance Scum; Overtreatment! I’m angry wth you! Damn, that was a great post. When was the last time scientists found a cure for anything? Polio? With all the medical technology and DNA research we have and all they can up with is “treatments,” not cures. That’s because corporations don’t make money from cures. Hadn’t thought of it that way, but you have hit a nerve… reasonably effective treatments for medical conditions represent a predictable income stream. A cure for depression, for example, might make Big Pharma even richer for a few years, and then… they’d have to invest in a cure for something else. How depressing for them! Better for cash flow, as you suggest, to suppress or at least control the symptoms, but maintain the chains of chronic treatment. Thanks, again Michelle, you made me think today (never a given! ), and I appreciate the notice!